Planning to buy beautiful sarees online in India at a price that suits your budget? Look no further than WoodenTant. 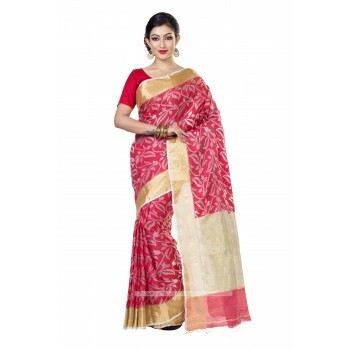 We have years of industry presence and have carved a niche in the industry by projecting ourselves as one of the leading online retailers of handloom silk ghicha sarees online. Since this six-yard is a symbol of Indian feminity, we present products of the finest quality. Whether you are planning to buy Cotton Sarees online in India or have a liking for Bengali Tant sarees, we are simply the name to trust. We undertake the entire responsibility of ensuring that raw materials of the highest grade are used during the manufacturing process. We have something for every traditional and contemporary saree lover in India. While others just boast of being the most reliable online saree manufacturer, we let the quality of our beautiful sarees bespeak our prowess. Whichever saree you opt for, the elegant design will add grace to your personality. Just browse through our wide range of Silk Dhakai Jamdani sarees and you will be spoilt for choices. Each and every client approaching WoodenTant has praised us for offering genuine designer cotton silk sarees online at the most affordable prices. If you are not quite sure which saree to opt for based on the occasion, feel free to give us a call and our friendly team members will help you make the right choice.